Wismec Reuleaux RX75 Box Mod Kit – ONLY $18.87!!! 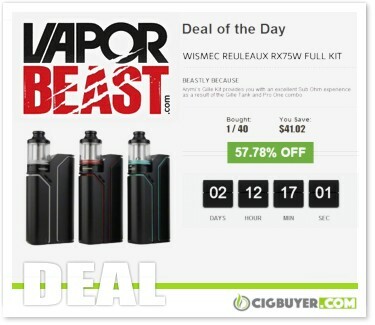 Here’s a killer deal from US vendor Vapor Beast – get the Wismec Reuleaux RX75 Starter Kit for only $18.87! Although it’s over 2 years old now, the Wismec Reuleaux RX75 Box Mod retains most of the features that vapers are looking for and offers some unique design elements that continue to set it apart. Developed by Jaybo, it’s powered by a single 18650 battery and provides up to 75W with full temp control (Ni/Ti/SS) and TCR. What’s really neat is the recessed tank section, discreet firing bar and hidden adjustment buttons and OLED display. Sold as a complete kit with the 2ml Amor Mini Tank, the Reuleaux RX75 has a sleek and compact design that’s truly one-of-a-kind.